Luis Lopez looked to be the Padres starting second baseman in 1995, but a torn ligament and Tommy John surgery ended that talk, The New York Times wrote. By 1998, Lopez was still playing, but it wasn't starting. Lopez was coming off the bench for the Mets, a role he told The Times he had accepted. "My approach right now," Lopez told The Times in April 1998, "is to come to the ball park and go about my work. If I'm playing, I go out and do my 100 percent. If I'm not, I've got to be ready whenever they need me." Lopez went on that year to get into a total of 117 games, the most he would see in a season in his 11-season major league career. Lopez' professional career began back in 1987, signed by the Padres as an amateur free agent out of his native Puerto Rico. He played his first year, 1988, at short-season Spokane, hitting .304. He made AA Wichita in 1991 and AAA Las Vegas in 1992. He made major league San Diego in 1993. Lopez debuted with the Padres as a September call up. He got his first major league hit Sept. 9, against the Braves, on a check swing. "It was a bad pitch," Lopez told The Associated Press of the hit. "I checked the bat and the ball went through. I was lucky." It was one of five hits Lopez got in 43 at bats that year. Lopez returned, though for 77 games with the Padres in 1994, hitting a better .277. He also hit his first two major league home runs, his first home run coming in the form of a grand slam. Lopez told The AP that grand slam was his first. Ever. "Not even in Little League," Lopez told The AP. "But in Nintendo I hit some." Then came Lopez' year rehabbing from Tommy John surgery in 1995. Lopez returned to the Padres in 1996, getting into 63 games. Lopez then moved to the Mets for 1997, getting into another 78 games. Lopez hit .270 for the Mets in 1997. That September, Lopez used one of his hits to break up a Curt Schilling perfect game-bid, a line-drive to center field. Lopez continued his part-time role in 1998, as a backup infielder. After an April game, where he hit a two-run, tie-breaking triple, Lopez told The New York Daily News the Mets had a daily second baseman and a daily short stop. "I'm the backup and I come to the ballpark to help the team win," Lopez told The Daily News. 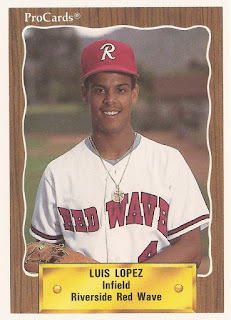 Lopez continued to play in the majors into 2005, playing for the Brewers, Orioles and, finally, the Reds. His career finally ended after another injury, a torn right hamstring. "I knew that I did something, but nothing of that magnitude," Lopez told The AP after the injury. "I've still got a lot to offer baseball." Lopez has offered more to baseball since, as a coach in the Red Sox system. Lopez served as hitting coach at short-season Lowell in 2008 and 2009, then at single-A Greenville in 2010 and 2011.